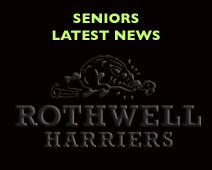 Seniors Latest News 2019 – Rothwell Harriers & A.C.
All the latest news and views. Be sure to check here regularly for information about forthcoming events, race and even reviews, training news and other important information. Membership fees are now due for 2019/20, In order to renew membership can you visit the above link. Can I ask that you renew as soon as possible to allow all members to signed up with England Athletics before your membership expires.